I’d dearly love it if you could use one of the Pinterest or Facebook buttons above – Thank YOU! When we were little, Mama made these wonderful candied apples for us from time to time, it didn’t even have to be fall! She always made extra for our friends, too. She made pretty much everything and we thought she was the best thing since sliced bread, which was about the only thing she didn’t make (although she did make a mean biscuit and got into bread making later on in our lives), and our friends thought so too because they flocked to our house in droves. That was the kind of house Mama wanted, one where her kids and their friends felt comfortable and welcome. There are many benefits to this but the primary one is that – she knew where her children were and that they were safe. I can’t think of one thing that my mother cooked growing up that didn’t taste good. She made homemade cookies twice a week, a full breakfast every morning, a hot lunch every day, and a full supper every night. She’d been cooking like that since she was thirteen years old and she was every bit as skilled as my great grandmother at stretching a meal and pinching a penny til it sang the national anthem. She was a couponing pioneer and back then used to do “refunding” too as a means of getting Christmas gifts for us and little checks for a few dollars here and there to help out with the groceries. Our most beloved Christmas presents came from sending in collected proofs of purchases from this product or that. One year Santa brought me a beautiful doll who came with a bathtub and her own miniature bar of ivory soap! Another year we got a talking calculator to share, and my brother spent two entire summers wearing “Tuff Stuff” t-shirts that featured a bulldog advertising insulation (My dad worked on houses as a spare job). He’d liked them so much that Mama just kept collecting proofs of purchase and sending them in to add more to his closet. 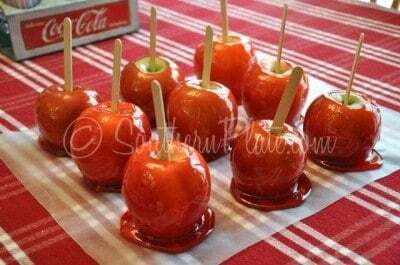 Oh yeah, my Mama made Candy Apples for us when we were little. These are really very simple to make and don’t require any fancy ingredients but so few people seem to make them nowadays, I guess because they are sold in grocery stores and such ready made. Those still don’t hold a candle to these though. Have you wowed your family and friends lately? These Candy Apples will do just that! You’ll need: 8 apples, sugar, light corn syrup, red hots (or cinnamon candy like red hots), red food coloring, a candy thermometer, and wooden sticks of some sort. I know some folks balk at light corn syrup but I’m cool with it. 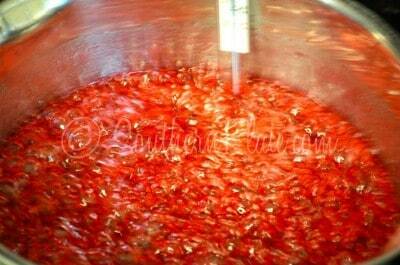 In a medium sized heavy sauce pot, place sugar. 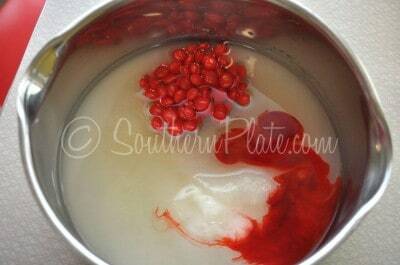 Also add water, red hots, and red food coloring. Stir that up a bit. Place over medium high heat and cook, without stirring, until it reaches 290 degrees. This is gonna take a while, probably anywhere from 20-25 minutes or so, depending on how hot your eye is. Okay so maybe I stir a time or two but Mama’s recipe says not to so you don’t have to but the world won’t end if you do. While that is cooking, remove the stems from your apples but holding the stem in one hand and the apple in the other and twisting. An old wives tale says that every time you twist the apple stem once, you say a letter of the alphabet and whichever one you land on when the stem comes off is the first letter in your future spouse’s name. I doubt many folks get beyond E or F with that though 🙂 I don’t have to worry about that with Katy Rose because she says that when she gets old enough to get married she wants ME to pick out your husband! She asked me if I’d do that and I immediately responded “I sure will, baby!”. Now stick your sticks in each apple. If you have a hard time finding Popsicle sticks, just go to the kid’s craft section and they have all sorts of wooden craft sticks that work very well. You can also use wooden skewers from the grilling section. I’ve even used forks from my kitchen drawer before 🙂 They work great and when you’re done just stick ’em in the dishwasher. Either way you go, there isn’t a need to go buy anything special or go on a wild goose chase because there is surely something on hand that will work just fine. I’m hoping you can actually read your candy thermometer. I’ve never really been able to so I kinda go on gut and hope – and continually vow to get one of those digital candy thermometers I can actually read. Now that our candy coating is done remove it from the heat and place it on a hot pad because it is H O T.
This is like one of those “Coffee-is-hot McDonald’s warnings”. While I’m at it, might as well go full on public service message and add that irons are hot, needles are sharp, cyanide pills aren’t for snacking on, and rattlesnakes don’t make good pets for cuddling. Whew. I feel like I just saved some lives here. 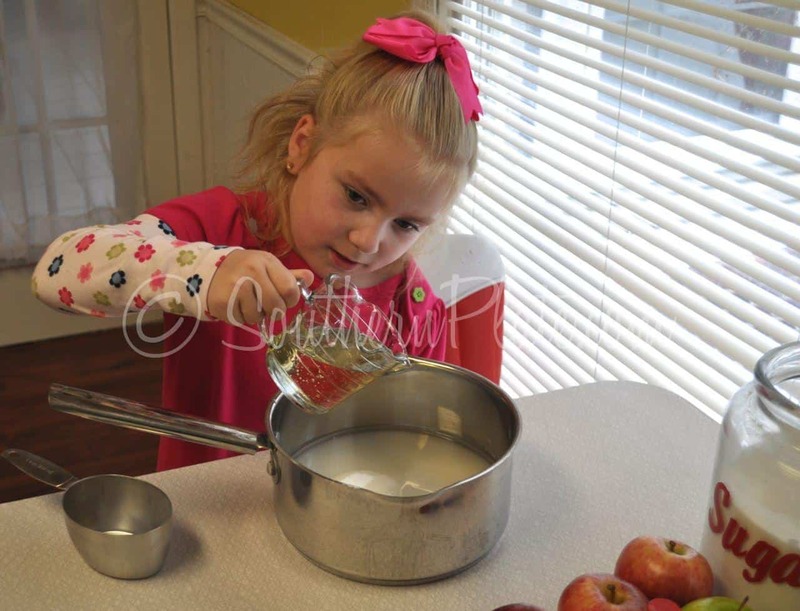 Quickly dip an apple in it and swirl it around a bit until it is evenly coated. 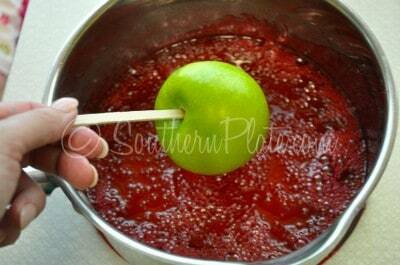 Remove the apple and hold it over for a few seconds to allow excess to drip off. Complete with remaining apples and place onto greased or buttered waxed paper (or a greased baking sheet) to cool completely before eating. Best if eaten within two days. If you have teeth like I do, you can do what I do and make these for the kids and click here to get the candied apples I can eat with all the flavor but none of the dental bills. 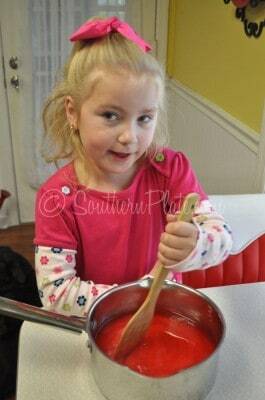 In heavy saucepan combine the sugar, corn syrup, candies, red food coloring, and 1 cup of water. 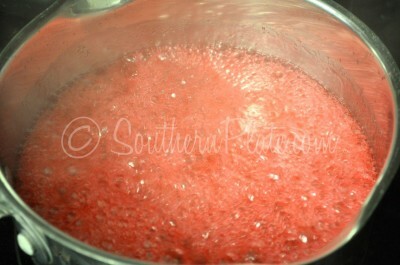 Place over medium heat and bring to a boil without stirring. 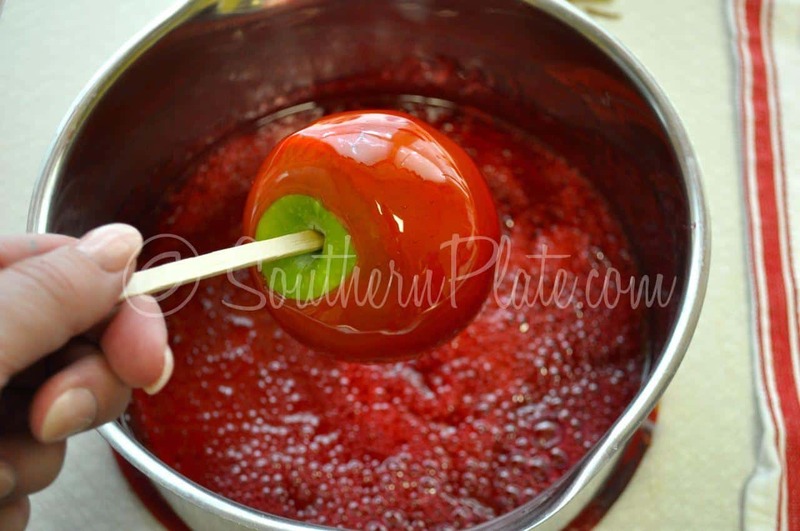 Set a candy thermometer on the side of the pot, making sure the tip doesn't touch the bottom and continue cooking, without stirring, until the temperature reaches 290 F, about twenty minutes. Meanwhile, grease a cookie sheet. 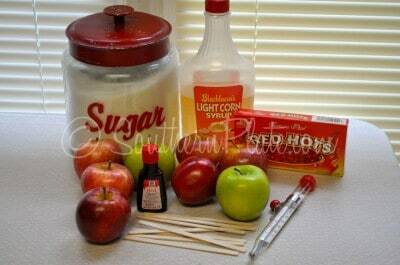 Remove stems from apples and insert a popsicle stick partway through each apple. When candy is ready, remove pan from heat and remove thermometer. Swirl each apple into candy syrup until it is coated and then hold over the pot for a few seconds to allow any drips to fall off. Place candied apples on a cookie sheet to cool. If the syrup begins to stiffen while you're still dipping apples you can place the pan over very low heat while you finish. Let apples cool at least an hour before eating. You can speed this up by placing them in the fridge if you like. 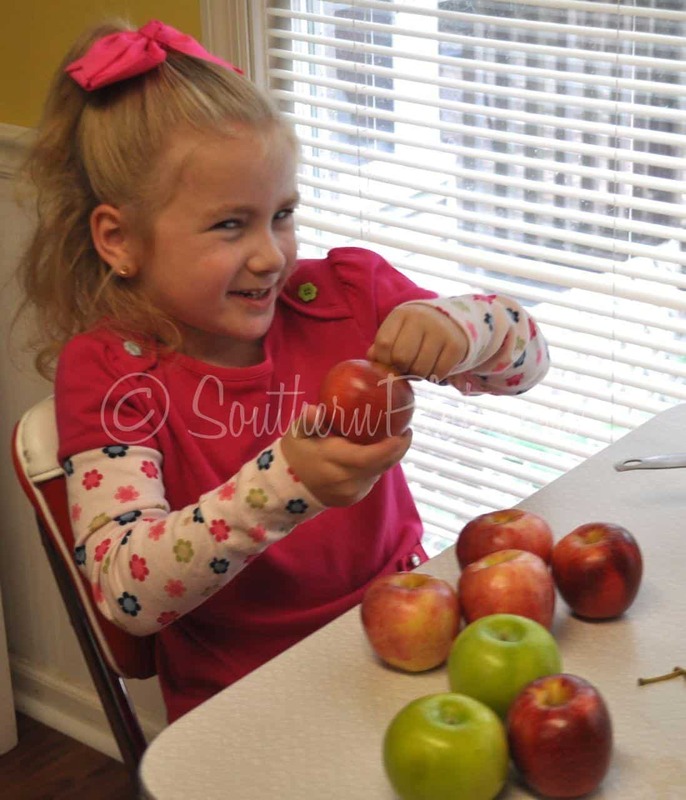 Did your Mother make Candy Apples when you were little? Have you ever made them for your kids? Do you have any memories of Candy Apples at fairs or festivals or special events when you were a kid? than you can with pressure. 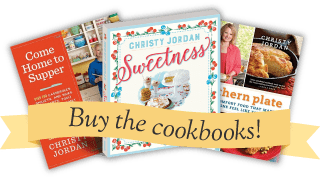 Banjo Pickers – The sandwich that’ll make you sing! I had to tell you I tryed your daddys covonut cake OMGOODNESS delicious I tweeked it a little. I accidently bought the sweetened coconut. So I decreased recipe to one cup of sugar, then I sprinkled some coconut on top (OUTSTANDING) . THANK You. Lynnette thanks for the memory bump!… We counted to see how many children we’d have too!! Like you I haven’t thought of that in years! Oh My goodness, Christy. I didn’t know anyone else twisted the stems off and said the alphabet. I had forgotten about that. The candied apples look so great. Will try them . Look forward to yoyr posts . They make my day. Enjoy reading all. I just made a similar recipe this past weekend with my grandson and what a good time we shared! But there is one VERY important word in the recipe buttered!!!!! I missed the little 8 letter word and all the apples adhered to the wax paper & the paper became one with the apple. In my world eating around the paper was just fine! Thanks for all your great recipes! I’ve never been into the candied apple, but they look so pretty Christy that you make me want one!! 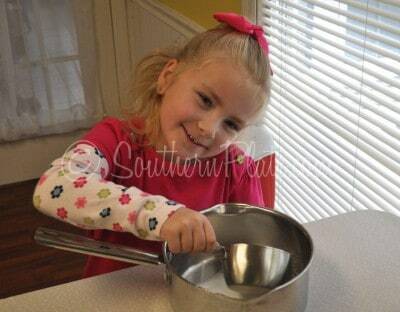 That’s funny that people didn’t know what an “eye” was…I have never heard anyone in the South refer to it as a burner! The candy apples look soo pretty, but I’m with you – too dangerous in the dental department! How cinnamon-y do these taste? I don’t remember the candy apples from the fair tasting like cinnamon at all, just crunchy-candy goodness… So I’m hoping for a very light (or non-existant) cinnamon taste. Okay if you remember apples from the fair you’ll understand this: they just taste candy apple-y. Lol. Not cinnamony. There aren’t enough red hots to add that in. Hope I make sense! That makes complete sense! Thanks so much, Christy! These will be so fun to make! Thank goodness you can read my mind a little! Even I thought I sounded a little loony in that answer, lol. Well, I actually WOULD like to have Red-Hot heat and flavor on a candy apple. How many Red Hots could I add? Could I also add actual cinnamon? How would that change the texture? I don’t believe adding any more red hots will make it taste a spicier but you can definitely try cinnamon. I might look at adding a pinch or two of cayenne along with the regular recipe but I’ve never varied from this one so report back if you try it! Thank you, Christy for posting this recipe. My husband has been asking for these all week and my two granddaughters chimed in that they wanted these also. I still play the “alphabet” game anytime I twist the stems out of apples and I’m 58,lol. Oh and how much Katy Rose has grown I didn’t realize it until I saw these pics. She’s pretty as a picture, just like her Mama. Take care and love love love your recipes. So do you think a person can just dip apple slices on a toothpick for a party tray? I tried this too. I think the apple slices were too wet to hold the candy coating. It didn’t work for me. I do enjoy reading your posts everyday they always make me smile. I also love the recipes, you always manage to make them a little simpler….I am not the best cook in the world. But after reading your recipes I think to myself…”I can do that”. Thanks!! Just really look forward to your posts ,everything you make looks so good & not really that hard to make. Love your little helper she is getting so big & pretty as can be,Katy Rose keep up the good work you do with your mommy. I went to the county fair last week just to get a candy apple. YUM!! Do you think it would be good if I substituted cherry hard candy for the red hots since I don’t like them. Any thoughts? Every time I read on of your posts it really makes me think of my growing up in Kentucky years. So many good memories, so much good soul food cooking as my mom used to call it. My first time! I have enjoyed your apple candy recipe. Thanks! 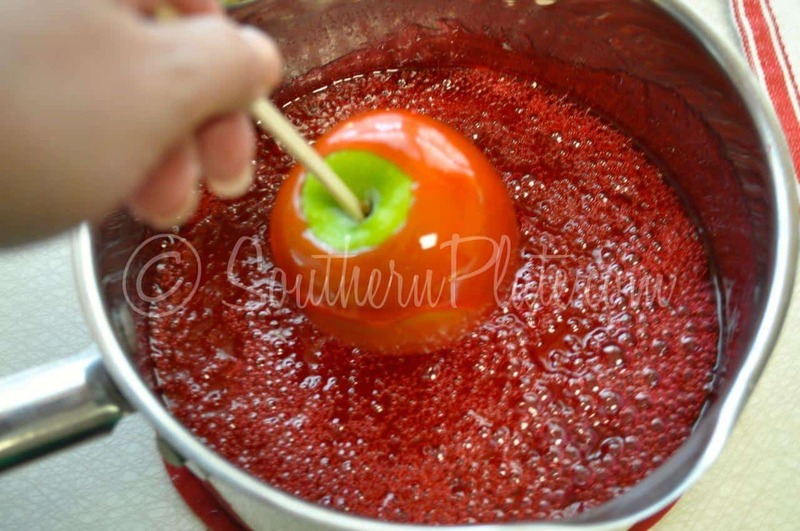 Wow, I’ve always wondered how to make the “red candy apples” like you got at the fairs & carnivals. Now I know and I’ll try it!!! Thanks Christy!!! SUCH a GREAT & DARLING MODEL THERE ! She is just ADORABLE ! And LOVE her Smile ! When I was a little girl, we lived in a neighborhood in Morgantown, West Virginia, where there was a lady who made them for every trick-or-treater who came to her door. Sometimes we’d knock & she’d tell us to come back in about 15 min. (or 5 min. or whatever!) 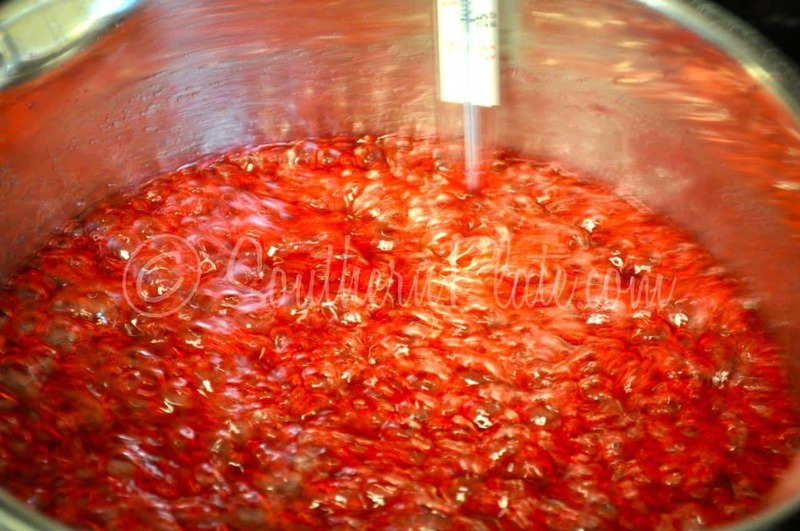 and the next batch would be ready for us. 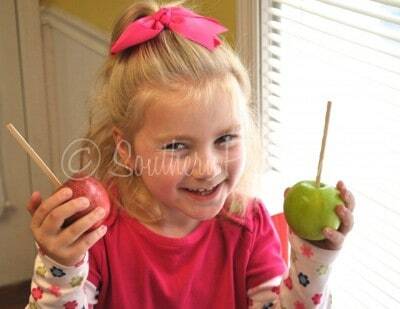 We lived in that neighborhood for about 3 years, and she always had the candy apples for us. God bless her! Nowadays you couldn’t do that–people would be suspicious that the apples were poisoned or something! I haven’t had a real candy apple in years–all I see anymore are the caramel apples, which are good, but they aren’t candy apples! Gotta try your recipe. I am making these right now with my 8 year old daughter. I looked high and low for a hard candy candy apple (does that make sense) all I ever see it jelly apples and they are surely not the same thing. Thank you Christy My daughter is having a ball measuring and watching the thermometer. She will not forget this! Hi Heidi! I am so glad to hear that you are enjoying your time in the kitchen with your daughter!! Making memories that will last her a life time is just priceless in my book! I had to use Hot Tamale candies, because I couldn’t find the Red Hots 🙁 BUT I believe they still turned out right……considering I’ve never eaten a candy apple……I used my candy thermometer, but goodness…….15 minutes later they’re still soft…..grrrrrrrrrowl! I sure hope they harden! My Mama made candy apples, too. She left out the red hots, though! I really enjoyed preparing and finishing this project. I hope it goes over well for the bake scale to support a family who lost their 9 month son. I enjoyed these as a kid. My mom made them for me. Growing up in Memphis Tn, they were a tradition. Better than gummy caramel and very pretty. The hot tamales I added were a twist. Made good flavor. Maybe I wll make lollipops. I will experiment with more projects! Thank you for posting. I live where taffy apples seem to rule! The entire time I read this recipe, I couldn’t stop thinking, “What a dangerous thing to do while in a wheelchair!” I know how hot that stuff gets. It wasn’t until the end that I realized it is an older recipe. Thank goodness! Oh, what memories came rushing back as I read this post! Like your Mama, I too saved those labels & got things for my family. I got my kids winter hats from saving Libby fruit labels! (that was a lot of fruit!) And a red, white & blue basketball. Among lunch boxes, sandwich boxes, Hot Wheels & carrying cases! I kind of miss those days. I saved the refund/rebate checks & whatever I saved using coupons to help buy Christmas presents. They got a little extra by doing that. I made candied apples with about the same recipe you have & they loved them. Sometimes I put chopped peanuts on them. (& my kids would eat the candy that run on the wax paper) I made them for school one year, had to make about 120 of them! Swore I’d never do that again! Lol! Thank you, Chrisy! LOL, that is a LOT of candy apples Diana!! Never made candied apples but om made molasses popcorn balls, we didn’t have corn syrup much but molasses was a staple in the house. The nuns at the Catholic church made a candy with the corn syrup that was delicious, looks like the same thing but they poured it in moulds about 2.5 by 4 inches and half an inch thick they sold them at recess at the school, and they went fast, used to give my friend the money to get one, and we’d break it with a hammer and feast after school that day! I think I shall try this out, my hubby will eat it I’m sure, I love them but would probably blow my sugars all to hell and gone! May eat one anyway! Christy thank you for the inspirational message with this post. I always look forward to your Friday emails with a blessing!